At the age of 14, Blessed Alexandrina jumped out of an upstairs window to avoid being sexually assaulted. Her spine was irreparably injured and by the age of 20 she was confined to her bed, suffering great pain for the remaining 30 years of her life. She voluntarily accepted the will of God and offered herself as a victim soul in union with the sufferings of Christ. From 1942 until her death in 1955, she received no food except the Holy Eucharist. There is a short biography at the Vatican website. Pierced Hearts has a longer article with some further details. 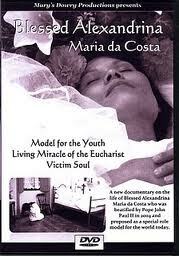 Mary's Dowry Productions have published a DVD of the life of Blessed Alexandrina. See that page for more information. I have watched this myself and recommend it as a simple, sincere and beautiful treatment of her life and spirituality.